A ballot will be held between 6pm and 8pm this evening. THERESA MAY has vowed to fight a motion of confidence in her leadership, after members of the Conservative Party reached a threshold to trigger a ballot yesterday. The chairman of the party’s backbench 1922 committee Graham Brady confirmed this morning that at least 48 Conservative MPs had written to him calling for a vote on the motion. It comes two days after May announced the deferral of a House of Commons vote on her EU withdrawal agreement. Reports from the UK are now suggesting that May will step down before any election – though this hasn’t been confirmed by May herself. Breaking: @theresa_may to step down before election: clear pitch to her potential enemies tonight, especially leadership wannabes, to back off and let her finish Brexit. "This vote isn't about who leads the party into the next election," her spokesman says. A spokesman for the Department for the Taoiseach told TheJournal.ie that a scheduled meeting between Leo Varadkar and May today would not take place. The spokesman added that it was not known whether the meeting would be rescheduled if May survived tonight’s vote, saying there was a tight deadline before this week’s Council of Europe meeting. May told reporters outside Downing Street that she would remain in London to make the case for her leadership with her party colleagues. In a statement confirming that the confidence motion would take place, Brady said a ballot would be held between 6pm and 8pm in the House of Commons this evening. “The votes will be counted immediately afterwards and an announcement will be made as soon as possible in the evening,” he said. Speaking to reporters later, Brady did not reveal how many MPs had written to him to trigger the motion, but said he spoke by telephone with May last night. In a speech outside Downing Street shortly before 9am, May said she would “fight the vote with everything” she had. 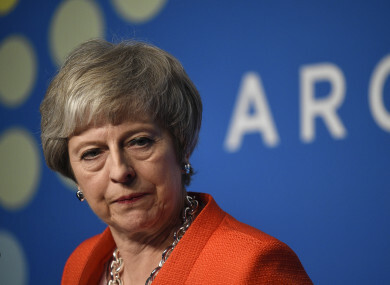 “A change of leadership in the Conservative Party now would put our country’s future at risk and create uncertainty when we can least afford it,” May said in her speech. May also warned that a new leader wouldn’t be in place by 21 January, the legal deadline to ratify the EU withdrawal agreement, and said a leadership election would risk handing control of Brexit to opposition MPs. “The new leader wouldn’t have time to renegotiate a withdrawal agreement and get the legislation through parliament by 29 March,” she added. May needs 159 Conservative MPs to support her in order to survive the vote. Several have already expressed the confidence in her following the news this morning, including Sajid Javid, Brandon Lewis, Amber Rudd, Liam Fox, and Michael Gove. “The last thing our country needs right now is a Conservative Party leadership election,” Javid tweeted. Gove – who has previously been touted as a potential successor to May – also called on his fellow Conservatives to back her in tonight’s vote. “She is battling hard for our country and no one is better placed to ensure we deliver on the British people’s decision to leave the EU,” he said. Leading Brexiteer Jacob Rees-Mogg, who earlier this year confirmed he was one of those to have written to Brady, welcomed news of the vote. “The Country needs a new leader, it is time for Mrs May to resign,” he said. If May survives the motion, a second vote cannot be taken by party members for another year, but she could still face a no-confidence motion from opposition parties. Email “'I will fight that vote with everything I've got': Theresa May to face confidence vote in her leadership tonight”. Feedback on “'I will fight that vote with everything I've got': Theresa May to face confidence vote in her leadership tonight”.